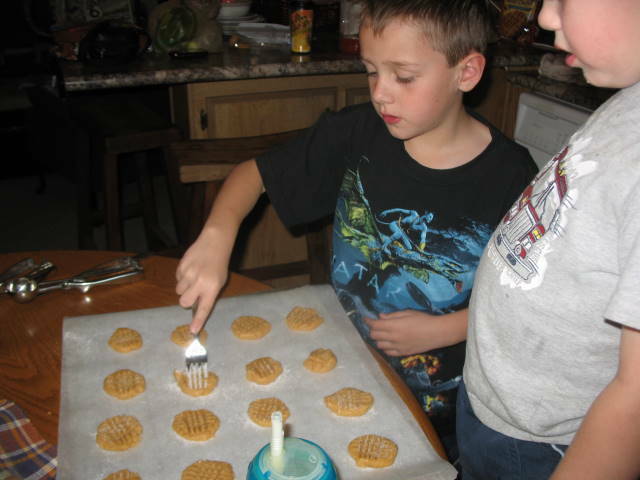 I kinda happened upon this recipe as a mistake… I was happily making peanut butter cookies with two of my grandsons and when I decided that one batch just wasn’t going to be enough…. 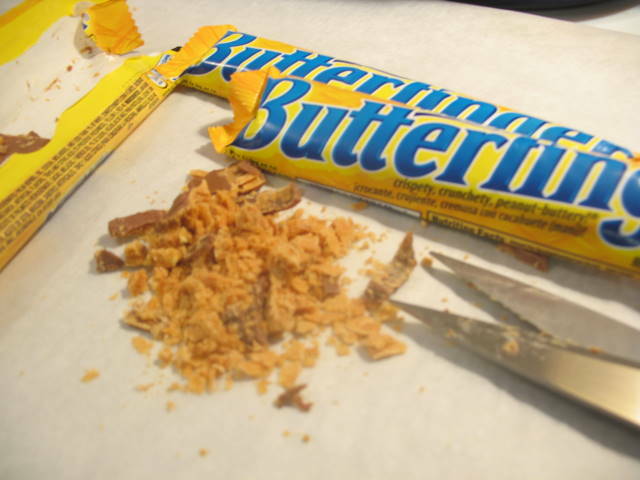 I headed back to the pantry to grab another jar of peanut butter and hiding there just beyond the box of graham crackers and open box of Toy Story snacks, I spied a real live butterfinger bar! In fact… there were a few of them! Obviously, I forgot I bought them last week or they would have been gone by now! Then I wondered… Hmm… I decided to toss a few into my next batch of cookies. 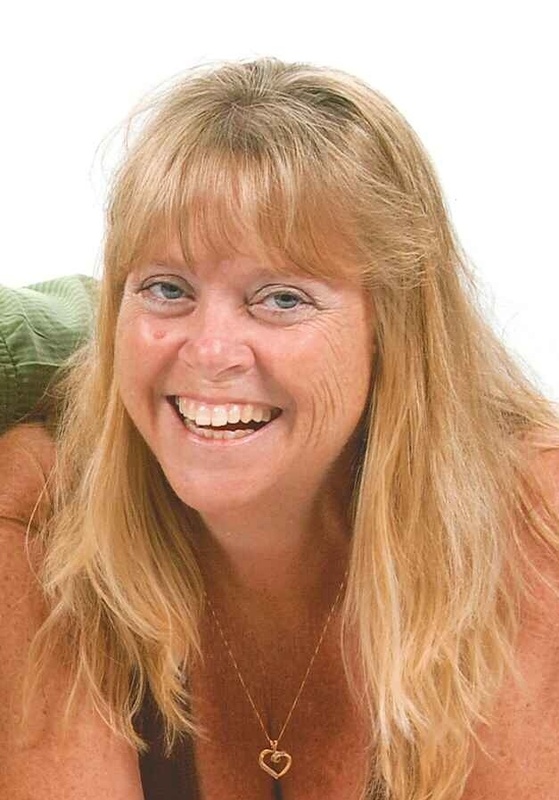 I’m happy to say, I am thrilled with the results! Cream together first 5 ingredients on list, add egg and mix. Next blend in last 3 ingredients and mix. 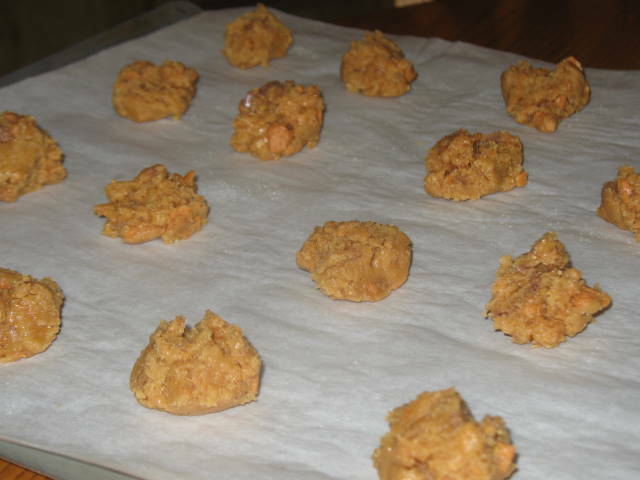 Take a spoonful of dough (small or large, depending on the size cookie you want) roll into a ball and place on cookie sheet. I use about a tablespoon of dough. Then take a fork dipped in sugar and press down to make a criss cross design on dough. If you have little helpers around (like I do), this is a nice job for them!! 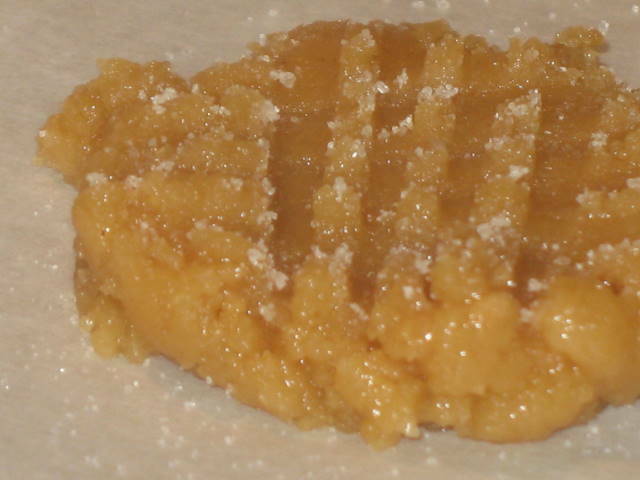 Pop into oven for 10 – 13 minutes until golden brown – if you like crunchy cookies leave them in a little longer. That’s your Peanut Butter Cookie! Now for the fun part…. 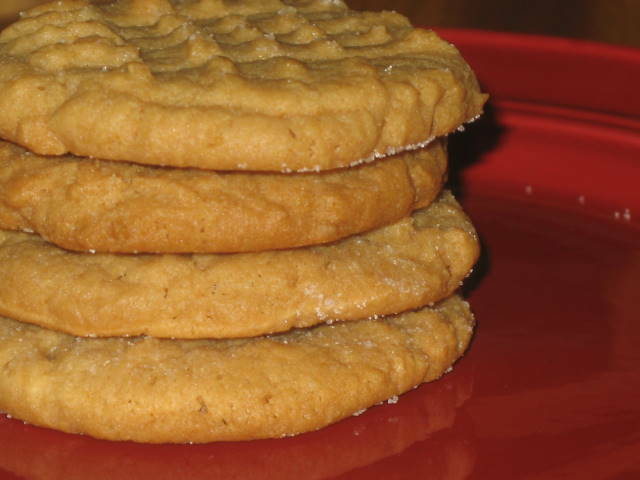 make another batch of peanut butter cookies… of course you could always just divide your batter in half from the start, but I usually don’t have much left. 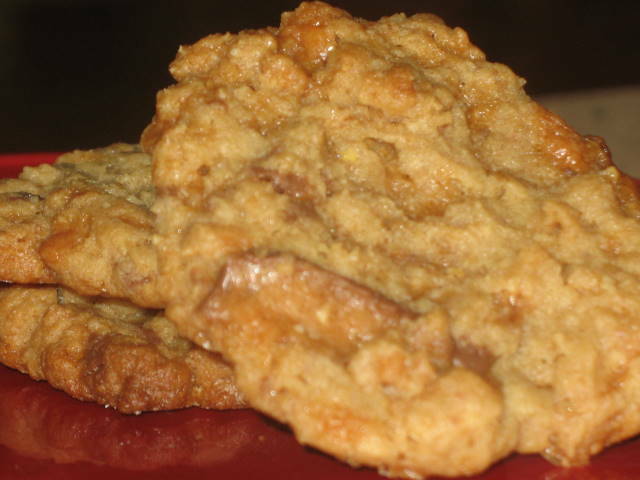 I almost always make a double batch of cookies! 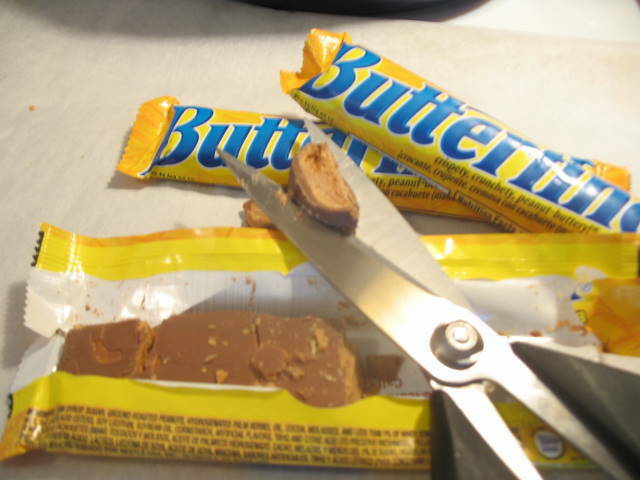 Take a couple bars of Butterfinger… make sure you have an extra one to munch on while your waiting for the cookies to bake! I took my kitchen scissors and cut them in strips instead of mashing… I don’t know why, but it worked for me. The bars break apart easily. 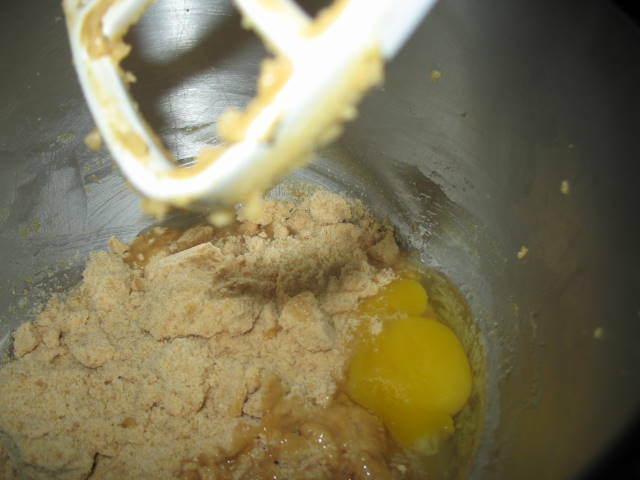 Gently mix into batter. I used the drop cookie approach here – so they would look different! Bake at the same temp for the same amount of time. These are… ahem… were DeeLishous!! !